The Secretary-General meets South Sudanese refugees during a visit to Imvepi settlement in northern Uganda in June 2017. As the excitement starts to build ahead of the United Nations General Assembly’s annual high-level session – which sees Heads of State and Government and top ministers from nearly all Member States gather in New York to weigh in on the vital issues of the day – Secretary-General António Guterres sat down with UN News to talk about the role of the 72-year-old Organization in a world that is facing more challenges than ever. 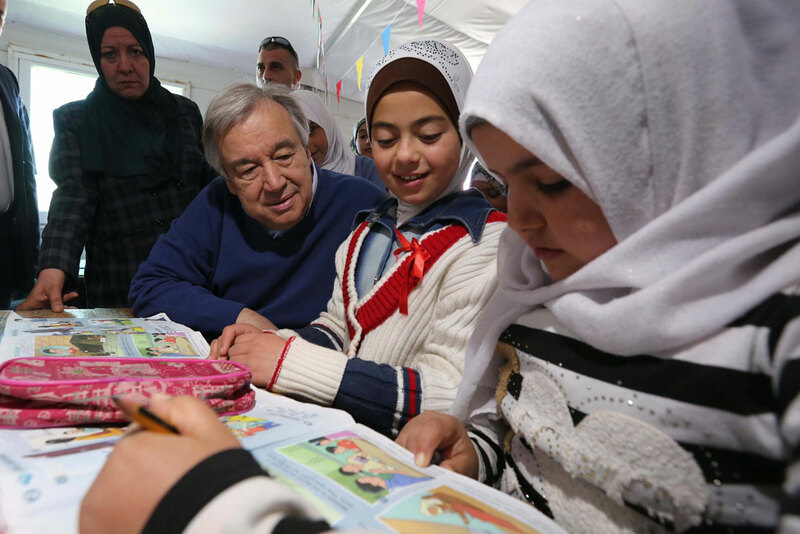 Mr. Guterres, the Prime Minister of Portugal from 1995 to 2002, and the former UN High Commissioner for Refugees, took up his post on 1 January this year. He has consistently pushed for, among others, increased diplomacy on nettlesome global issues, broad adherence to the aims of the landmark Paris climate accord, wider engagement with the world's youth and dedicated efforts to ensure gender parity across the UN system. Saying that the UN "must be an instrument for a surge in diplomacy for peace," the Secretary-General discusses how he is working with the international community to make parties to conflict see that "nobody is winning" in today's devastating wars; to spotlight the links between climate change and sustainable development to ensure a globalized world that "leaves no one behind;" and to follow through on his deep belief that an equitable presence of both male and female colleagues makes organizations work better. 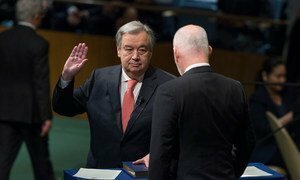 UN News: Mr. Secretary-General, with the new session of the General Assembly and its high-level debate coming up, what is the role of multilateralism in today's world and what are you going to do to try to strengthen this role? 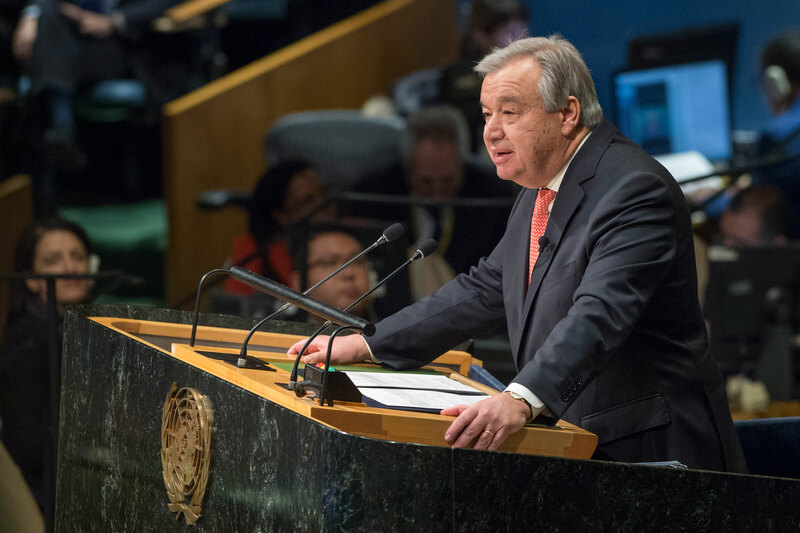 Secretary-General: We live in a world with global problems – climate change, terrorism, inequality – and there is no way we can solve [them] on a country-by-country basis. We see, more and more, that only global solutions can address global problems. And for global solutions to be possible, we need to have mechanisms of governance allowing countries to come together and manage together the problems of our times. 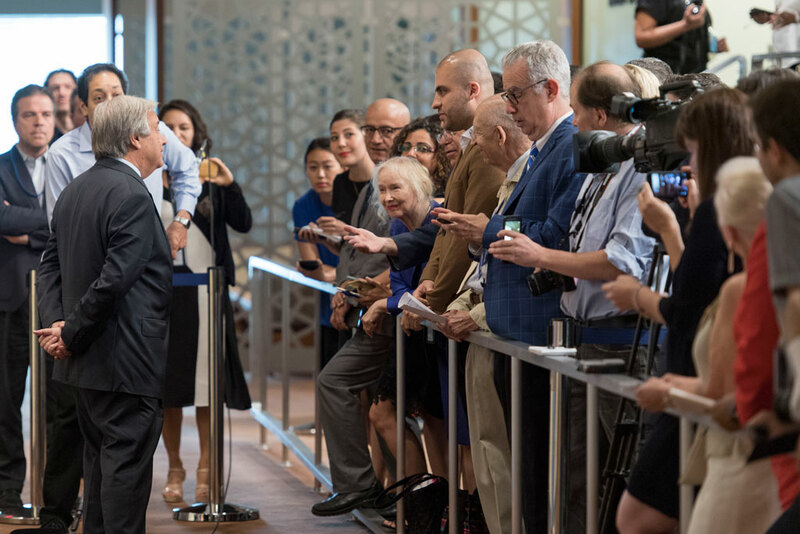 VIDEO: Secretary-General António Guterres talks with UN News about issues such as climate change, terrorism and inequality, as well as the role of the 72-year-old Organization. And so multilateral organizations – like the UN, but also like many others… the International Monetary Fund, World Bank, regional organizations like the European Union, the African Union… they're all essential to allow us to face the very dramatic challenges that are today threatening humankind. UN News: With all of the challenges facing the world right now – terrorism, extremism, the refugee crisis – what's your vision for the role the UN should be playing in today's world? Secretary-General: The UN must, first of all, be an instrument for a surge in diplomacy for peace and we are doing everything we can, facing all the crises that we have – from Mali to South Sudan to Libya to Central African Republic to Syria to Afghanistan to Somalia – to do everything we can to convince the parties to those conflicts and those that have leverage, that support the parties to the conflict, we are doing everything we can to convince them that these are wars that nobody is winning; everybody's losing. And it is absolutely essential that they forget their differences, their contradictions of interests and that they really come together to put an end to these tragic series of crises, violence and conflicts. Because these conflicts are also becoming more and more interlinked and more linked to global terrorism. So we need to fight terrorists where they are, but we need to address the root causes of terrorism. That means solving conflicts, and at the same time, building cohesive societies where people can feel they belong, where they don't feel discriminated [against] and respect human rights, to make sure that terrorist organizations have more and more difficulties recruiting people. Youth unemployment, for instance. Youth unemployment in certain parts of the world is one of the most dramatic problems that facilitate the work of terrorist organizations recruiting people that have no future. So we need – in sustainable development, in human rights and in a peace and security approach – to combine all the UN instruments in order to be able to defeat terrorism. UN News: We see the effects of climate change around the world. What's your message to everyone involved – governments, civil society, citizens – about the phenomenon and the Sustainable Development Goals (SDGs)? 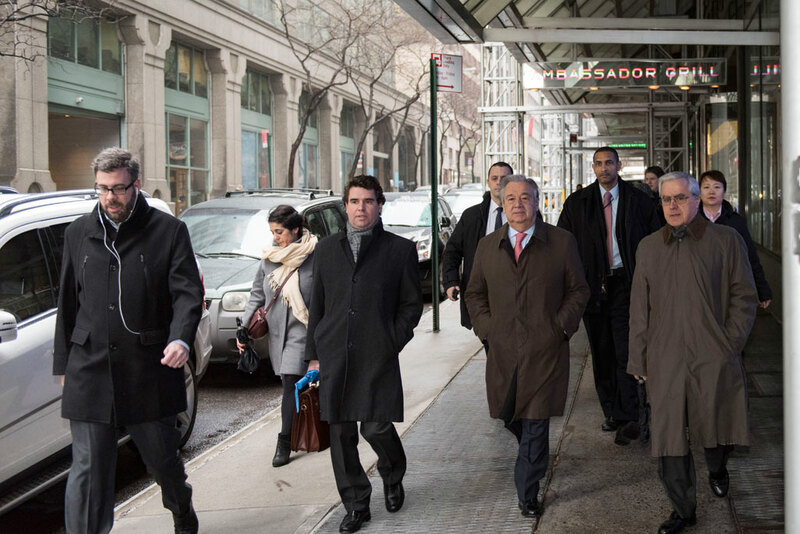 Secretary-General: First of all, climate change today is undeniable. I just came from my country, Portugal, where we are having a huge drought in the south. We're seeing forest fires multiplying terribly. In the United States, as in Portugal and other parts of the world, we are seeing heat waves, we are seeing dramatic floods – Sierra Leone, India, Nepal – we always had floods in the past but now natural disasters are becoming more frequent, more intense and with more devastating consequences. We see deserts progressing. We see glaciers diminishing. We see the sea levels starting to rise. So it is clearly a threat to us all. Second, to fight it we have today an important instrument – the Paris Agreement. We need to make sure that all countries commit themselves to that [accord]. And wherever countries are not able to do so at the government level, that the societies, the business communities, the cities, are able to lead the process and in this way, we can be able to meet the Paris Agreement, but with an increased ambition because Paris is not enough to be able to contain global warming at the level that is acceptable. At the same time, we need to see that there is a clear link between climate change and development, and the sustainability of development. So, the 2030 Agenda, the Sustainable Development Goals, are the global programme accepted by all Member States to have a fair globalization. A globalization that leaves no one behind. Contrary to what has happened in the recent past where we see so many regions that are dramatically, negatively impacted by technological progress or globalization. We need to make sure that globalization that has brought enormous advantages for humankind, that it leaves no one behind. That there is inclusivity and that there is sustainability for our children and our grandchildren also to benefit from what we are achieving today. UN News: A question dear to me – gender parity. You promised gender parity, and to strengthen gender parity within the UN system when you assumed office. Looking back at these past months, are you satisfied with what the progress so far? And what are your plans? Secretary-General: I've appointed members of the Senior Management Group, which is the top level of the United Nations, between appointments and the renewal of mandates we have done it with 19 women and 17 men, which means parity has been taken very seriously by me in the decisions I can make. And we will have, at the end of my mandate – this is a very strong commitment – at the level of the Assistant Secretaries-General and Under-Secretaries-General across the board, all over the Organization, full parity. We just approved a road map for parity that we will now submit to Member States in the areas where Member States need to take decisions aiming at reaching in 2023 in a majority of the areas of the UN, but for some that have more specific difficulties: in 2028, full parity for international staff across the board. So this is a strong commitment. And it's not because this idea is now very much in the public debate. It's because it's my deep belief that organizations work much better when there is an equitable presence of both male and female colleagues. UN News: In your youth, you stood up for the principles you believed in. What would you say to young people in today's world who want to do something against racism, Islamophobia, anti-Semitism and discrimination? Secretary-General: I think that young people are exactly my hope because young people are much more cosmopolitan. They are much less prone to these irrational approaches of nationalism, of xenophobia, racism; they understand diversity is a richness; it's not a threat. I hope that young people will push their societies, their communities, their governments to understand that they need to have policies of social cohesion, they need to have policies that allow for everyone to feel that his or her identity is respected but, at the same time, that they belong to the community as a whole. UN News: People want to know you on the personal level. So I have a few questions to try to do that. You are a fan of history. Who are your favourite historic figures? Secretary-General: Well I had two personalities that had a very, very important influence on my political life, both ideologically and in relation to the political attitude, political behaviour. One, in my youth, Olof Palme. Another, in the maturity of my life, Nelson Mandela. I think they correspond to a fantastic combination: on one side, the policies that are at the same time clearly oriented for equality, for a progressive view of the world, equality between people, equality between societies. Olof Palme has made a fantastic contribution to the development of a progressive vision of his country and of international relations. And then Nelson Mandela is the very symbol of forgiveness, tolerance and the capacity to rebuild a society that was so deeply and so tragically divided. UN News: Who is your favourite author and what is your favourite book? Secretary-General: I am, as you said, a compulsive reader of history. There are two history authors that I really consider the best I've read. One is French, Georges Duby. He was an excellent medievalist. The other is British, A.J.P Taylor. But of course, I am Portuguese; I come from a country of poets. There is a Portuguese poet that I consider absolutely unique: Fernando Pessoa. UN News: With all your responsibilities as the head of an Organization that people look up to for solutions in a complicated world, what do you do to de-stress? What do you do for fun? Secretary-General: Well, I like music a lot. So I [listen to] music at home. I go to concerts, operas frequently. I am very fond of contemporary art, so here in New York is the best place in the world – the galleries in Chelsea and other parts, contemporary exhibitions in the different museums. And at the same time, I love to travel – and to go and try to discover either aspects of cultural heritage or landscapes that are unusual, or to have contact with people that are different and can enrich us. So I would say these are probably the areas where I try to use my spare time to my own benefit.